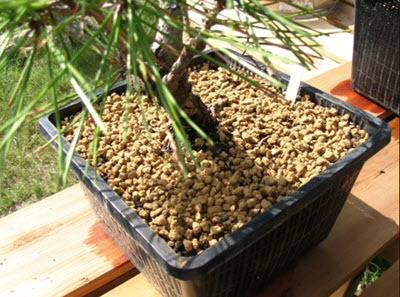 Akadama, also known as akadamatsuchi, is a granual mineral commonly used as planting medium for bonsai plants. In Japanese, the word akadamatsuchi ( (赤玉土) means red ball earth. Akadama can be quite pricey, especially high-quality akadama, but many bonsai fans are willing to pay for its ability to retain water and nutrients while still providing suitable drainage to prevent root rot. Akadama is a granular clay-like mineral. Its two main components are silicon dioxide (over 40%) and aluminium(III) oxide (over 25%). There is also quite a lot of iron (III) oxide in akadama, typically around 8.5%. Akadama also contains magnesium oxide (circa 2.5%) and small amounts of calciumoxide and manganeseoxide (less than 1%, respectively). Akadama is just slightly acidic, with a pH of 6.9. Akadam is available in various grades. Generally speaking, deeper-mined akadam tends to be harder and more sought after among bonsai keepers than shallow-mined akadam. Akadama can be used alone or combined with other substrates, such as pumice, stone, sand, or peat. It is a important to create a mix that is suitable for your particular plant. For some plants, akadama should never be used alone. Instead, it needs to be combined with other potting mediums. Examples of elements frequently mixed with akadama are sand, peat, composted bark, and crushed lava. Akadama will turn darker when moist and then get paler again as the moist leaves it. This characteristic can help the bonsai keeper to determine when the plant should be watered. There are reports of akadama granules breaking down into small particles that prevent proper drainage. The risk seems to be lower with deeper-mined, harder grades of akadama. Some bonsai growers try to prevent clogging by incorporating sand or grit.